25 songs from 1915, the year submarine warfare and the sinking of the Lusitania hit the news. Popular songs included the American Quartet's "On the 5:15" and Billy Murray's "The Little Ford Rambled Right Along," Al Jolson's "Sister Susie's Sewing Shirts for Soldiers," and one of the most famous war protest songs of all, "I Didn't Raise My Boy to Be a Soldier." 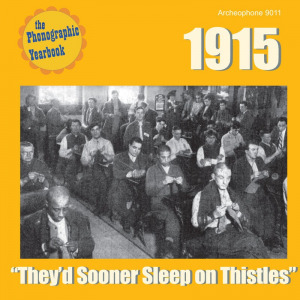 1915: "They'd Sooner Sleep on Thistles" includes a 24 page full color booklet featuring an essay on the Lusitania and the push to war, discographical information on the records, notes on the songs, and rare images and photographs. Visit 1915's expanded catalogue page to see the complete track listing, read an extended description, and listen to sound samples.